Parents, have you ever had a moment of fear about what your child was about to do next? You know, that feeling when you realize that what is about to happen probably isn’t good…and generally that always happens in public. Well, last month, we were at this large family gathering. It was actually a blending of two families and we were trying to get to know one another, and it was pretty great. Then, it came time to pray for the food and, just as the prayer was about to begin, Asher yelled and screamed, “No!” and said that he wanted to pray. I instantly had that feeling come over me as a parent – when I didn’t know what was about to happen, but I knew it wouldn’t be good. I looked at my wife and my jaw dropped. Because, Asher has never done this. In fact, I don’t think he’s ever really prayed out loud before. Most of the time, he’s the one talking through my prayer. In fact, he’s more likely to yell during grace than to do anything else. So, I share this with you, not because I have perfect kids, but for this reason…sometimes things stick and shine through, so have hope! 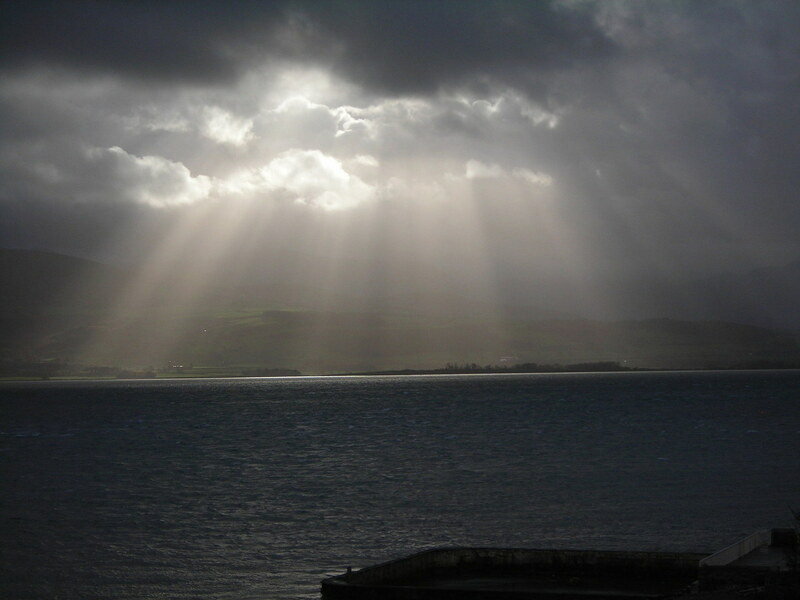 Read that again…sometimes things stick and shine through, so have hope! Sometimes, after fighting through grace at meal times, fighting through bedtime prayers amidst yells from your kids that they don’t want to go to bed and fighting through reading Bible stories while your kids wrestle…sometimes things stick and shine through. Jesus talks about it in Matthew 13 when He asks us to sow seeds. And, here is the thing…seeds take a long time to grow, but sometimes they sprout and grow, and you get to see this when you least expect it (like at a family gathering when everyone is watching). So, I share this with you to encourage you to hold onto hope. Parenting, grandparenting and seeing change in any relationship takes a long time. Sometimes, it just feels grueling, like you’re toiling for no reason. Sometimes, in beautiful moments, you see that it’s stuck and it shines through. So, don’t give up, because Asher sharing a deep and beautiful prayer when least expected has reminded me, we never know what’s going on underneath. I think parenting is an exercise in trust and hope. I mean you spend hours and hours with your kids, coaching, guiding, and if you’re at all like us – disciplining your kids. Sometimes if I’m honest you wonder if it’s all worth it. Like you know it’s all worth it, but after a giant fight at bath time, when your soaking, and kids are crying doubt creeps in. I think that’s why parenting is hard, because you are really playing the long-game in parenting. You are hoping that what you do today, pays off in decades. And it’s hard sometimes to keep motivated or to even know if all your effort is having an impact when the results are years and years away. But then every now and then you see some glimmer, you see a glimpse, you see some of the fruit. As many of you know Krista and I accepted a new position, so we’ll be moving and changing churches in the next few months. This was an incredibly hard decision, but one we feel certain about. A tough point though came when we came to tell our kids. And sometimes after hours and hours of wondering if anything sinks in, to little ears that don’t always seem to listen, you have a moment like this. You have a moment when you realize that your kids aren’t just kids, but people God speaks to. People who can pray better than you, and say the things you struggle to say, and people who remind you God is always working. So all of this is to say that if you’ve had a long week with your kids, don’t forget all that’s growing underneath. Because when God reveals their little hearts, you realize all the effort is worth it. It’s always worth it. Are any of you suffering hardships? You should pray. Are any of you happy? You should sing praises. Are any of you sick? You should call for the elders of the church to come and pray over you, anointing you with oil in the name of the Lord. Such a prayer offered in faith will heal the sick, and the Lord will make you well. And if you have committed any sins, you will be forgiven. Confess your sins to each other and pray for each other so that you may be healed. The earnest prayer of a righteous person has great power and produces wonderful results. Elijah was as human as we are, and yet when he prayed earnestly that no rain would fall, none fell for three and a half years! Then, when he prayed again, the sky sent down rain and the earth began to yield its crops. And here James shares with us some incredibly practical advice about prayer, healing, and sickness. James calls us all to pray if we are hurting, or in joy, that prayer should be our response (verse 13). And then he gives some incredibly practical advice – if you are sick you should call in the elders. The truth is that sickness has a tendency to isolate and to separate and James knows that in sickness we need others. So he says invite the elders in to pray, anoint, and support someone who is sick. This is because in sickness it can be so difficult at times to pray, so he says rely on the prayers of others. Be anointed a symbol of the Holy Spirit, and it was also thought to be medicinal. So pray for healing, and don’t shy away from those in the healing profession and medicine for help as well. James says bring in supports to care, love, pray, and anoint and to find God willing to heal. We also looked at the importance of confession, of the phrase the “name of the Lord” and a few others things. But most importantly, we landed not on more teaching about prayer, or about how to pray. 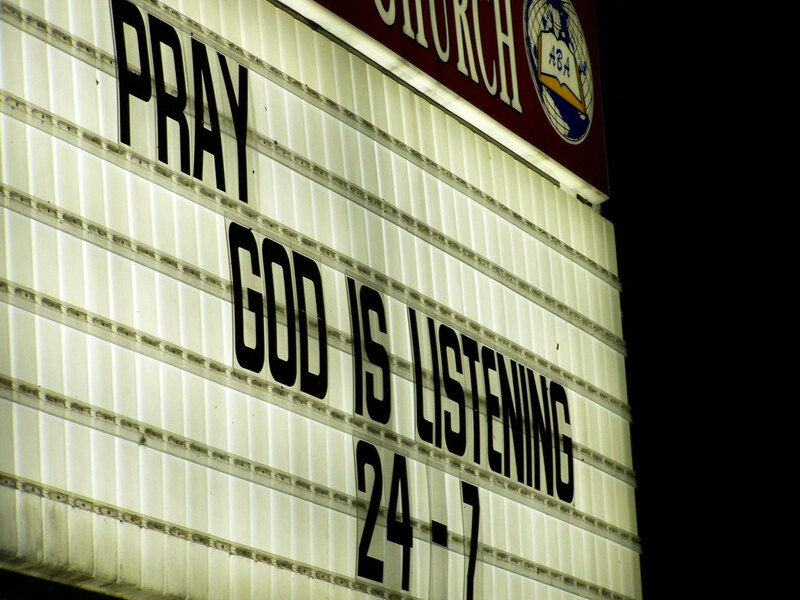 We landed on whether or not we trust in prayer. Because the truth is, if we know all about it, and even if I challenge people to practice it – if we don’t trust in prayer and in God, it won’t make a difference. So I asked us all to consider this question, “Do you trust in prayer and God to use prayer”. In spite of all the questions, the suffering we see, all the legitimate doubts and difficulties – do you trust in prayer? Because I believe that prayer is worth trusting in. I believe that prayer actually changes the world. I believe that even in spite of the doubts I have at times, like anyone, that prayer matters. So we ended with a challenge to prayer, and then ended the service with the only way that seemed appropriate. We invited people forward for prayer. And today if you are struggling in any way, I think today is the day to invite people in your life to pray. Because prayer matters, and prayer changes lives. Big Idea: Pray. Pray. Pray. Wherever we are at in life prayer is to be part of our life. Sickness has a way of separating us. Oil was medicinal and a symbol of the Holy Spirit and God’s consecrating. To pray in the name of the Lord is to pray and act as his representative and in his authority. Do you trust in prayer? It is God who is the healer. What stuck out to you from the sermon? What was challenging to you? What was new? What is your view of prayer? When have you seen a prayer answered? What are your questions concerning prayer? Who do you know that needs prayer and support? Who can you confess your sins to? Are you willing to? Talk to your kids today about the power of prayer. Ask them what they think prayer is? Ask them who they should be praying for – and then spend time in prayer with them. Challenge for the Week: To trust in the power of prayer. On Sunday we are going to talk about prayer. Prayer is something that is really important and should be part of the regular fabric of our lives. Prayer is something that really releases God to work in the world and in our lives. And this is a verse with a lot of tensions and complexities. Many scholars don’t like the idea of the Father abandoning the Son. This also raises consternation and concern about the Father’s character for me too. So scholars offer two solutions. One, that Jesus isn’t actually being abandoned by God, he is just feeling like he is. But that just seems like semantics to me, and goes against what seems obvious: that Jesus is experiencing being abandoned by God, because he is being abandoned by God. Other scholars point out that Jesus is quoting Psalm 22 (which he is). And taking the Psalm as a whole, it ends with vindication. That the suffering victim is eventually vindicated, justified, and that God overcomes the wrongful suffering. So they say Jesus is actually saying that he will trust in God to overcome this wrong. They (rightly) point out that speaking on a cross is incredibly painful and difficult. So Jesus couldn’t have quoted the whole Psalm (I agree), so he quotes one verse to bring the whole Psalm into view. Again though I just think this goes against the plain reading. If Jesus could only quote one verse because of pain, and wanted to talk about God vindicating him, he could have quoted the last verses of Psalm 22. But he doesn’t, he quotes a verse about being abandoned. So even though I might not like the idea of the Father abandoning or forsaking his Son, I think we are left with the plain reading of Scripture. But there is one obvious fact that needs to be stated, that actually changes the whole perspective of this verse. It is stated from Jesus’ perspective. We don’t hear the Father’s perspective. So Jesus is being forsaken by the Father, and then we assume, that the Father is above pouring out wrath on Jesus in an emotionless dispassionate state. People struggle with this verse because it makes it seem like Jesus is nice, whereas, the Father is stern, uncaring, judge, who abandons his son when he needs it most. But this is all based on an assumption, that the Father is unmoved by what his Son is going through. And this assumption is wrong, and what I not only challenged but worked through in more detail (download the sermon for more). “In forsaking the Son, the Father also surrenders himself, though not in the same way. For Jesus suffers dying in forsakenness, but not death itself; for men can no longer suffer death, because suffering presupposes life. But the Father who abandons him and delivers him up suffers the death of the Son in the infinite grief of love…The son suffers dying, the Father suffers the death of the Son”. And this is what we need to get, that the Father and Son are both affected and separated because of our sin. It isn’t a singular choice on the Father’s side to abandon his son. It is a choice within the Trinity to experience the separation of sin so that we could be welcomed into fellowship with God. The Father doesn’t kill his Son, to forgive us. The Father experiences an abyss of separation from his beloved Son, so that we could become incorporated into the family of God. Sin ruptures, that’s what it does. And it does this at the heart of the Trinity. So yes, Jesus experienced being forsaken by the Father, and the Father experienced the death of the Son. This led us to some simple but personal conclusions. First, that we need to be in reverent thanks of what the Father, Son, and Spirit went through to include us in their life. The Son died, so we could live. And this affected all the Trinity, and for that we need to be grateful. We need to be reverently worshipful of the depth of what God went through for each and everyone of us. Second, we talked about that sin is serious. That sin brought separation to the heart of God, and we need to own that. We did that. We killed the Son (read the Book of Acts). We need to recognize the seriousness of sin, and confess, repent, and rid ourselves of sin. If sin did this to God, we need to work at ridding ourselves of it. So we ended with a challenge, to sit in thanks to God, and repent for sin. When we see the depth of what God went through, I think that is the right response: reverence and repentance. Martin Luther said, “God forsaking God, who can understand it?” I know for sure we don’t all understand it because of one sermon (I certainly don’t), but I hope we got a little closer and most of all, a little more reverent and repentant. Big Idea: Jesus was abandoned by the Father for us; and the Father experienced the abandonment of the Son for us. This passage is not about us, but what Jesus is experiencing. If our sin separates Jesus from the Father; it separates the Father from the Son. We cannot understand the depth of our sin, unless we understand that both Jesus and the Father are suffering in this moment on the cross. The Son is losing the Father, but the Father is losing the Son. Our sin doesn’t just affect Jesus, but affects God as a whole. We should have holy and reverent awe for God. We should repent and cast off sin. What stuck out to you from the sermon? What was challenging to you? How did God speak to you through it? What was new? Have you practiced Lent before? What can you fast or give up this year? 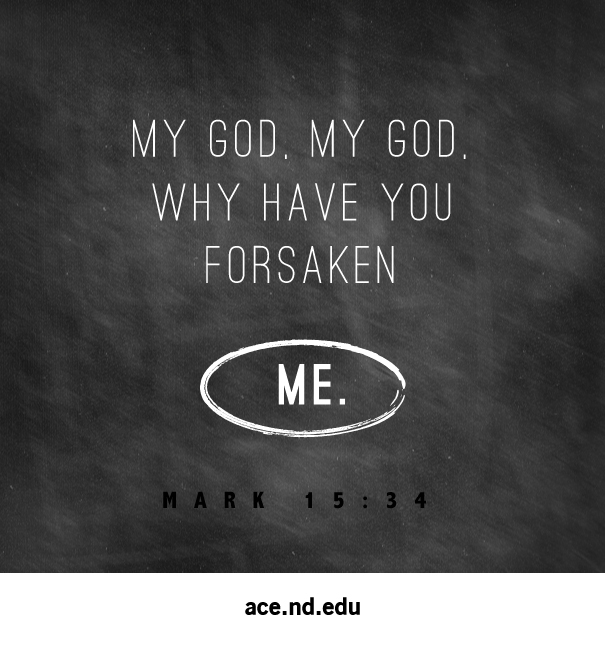 Had you ever struggled with the idea of the Father forsaking the Son before? Had you ever thought of what the Father went through when Jesus died? What do you think it was like for him? How does it make you appreciate God? How does it change or deepen how you see sin? Read the story today with your kids. Talk to them about the verse we read, about how Jesus was separated from his Dad because of our sin. About how hard it was, but that he did that for us. So that we can be loved, and welcomed in. Give them a chance to confess anything to Jesus in thankfulness for what he did.